RARELY AVAILABLE VIEW PROPERTY! Architecturally designed & tastefully renovated home with spectacular views of CITY, MOUNTAIN & WATER from multiple levels. From first steps into a private courtyard, quality is evident. Beautiful landscaping w stamped concrete leads into open concept main floor w wood burning FP, dark maple floors, gourmet kitchen/bar, Miele appliances. Upstairs an impressive NEWLY RENOVATED (2018) Master w spa-inspired ensuite, another bedroom & marble bathroom. Top floor is an awesome loft/bedroom leading to roof deck & 180’ views! Downstairs 2 spacious ensuite bedrooms, generous storage, sauna, flex room, laundry, utility. 3 car garage! 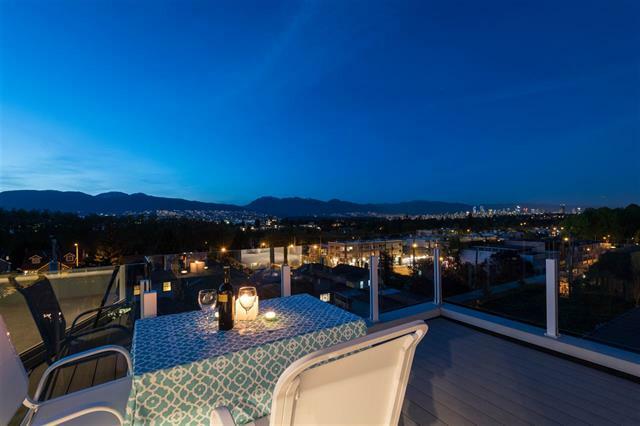 Terrific Point Grey location, quiet street, minutes to shopping, transit, YVR, parks, UBC, all the best schools. Great opportunity!